ADP reliably reported better than expected employment gains, gasoline inventories fell 1.6 MM barrels instead of the 100,000 gain expected, TPTB across the pond were all agog at how well the debt swap is going and — just for good measure — a QE rumor was leaked to WSJ reporter and Fed mouthpiece Jon Hilsenrath. Even the WSJ’s Marketwatch thinks this PPT reaction was a little too obvious. Interesting article here about the troubles small businesses are having in China. Growing problems include rising labor and materials costs, rising yuan, shortages of labor, lack of credit. We saw the markets react when China lowered their official growth projections from 8% to 7.5%. Of course, if the carefully managed number is 7.5%, we can only assume it’s really closer to 2%. Most investors understand how important China’s continued success is to the global economic recovery story. If China falters, it changes everything. Stay tuned. Slow and steady, SPX RSI working its way higher in a tight little channel that has taken SPX prices to the limit of the steeply declining channel established yesterday. 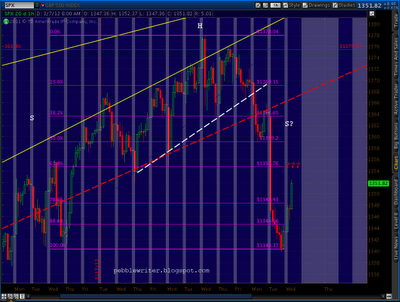 I think we’ll break out of it a bit, widen the price channel and possibly reach 1359-1363. But, anything above 1354 is on borrowed time — as I still believe this to be a contra-trend rally. 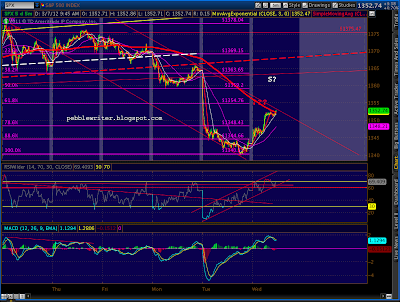 The retracement has picked up steam, reaching 1352.37 so far. The contra-rally is losing momentum. 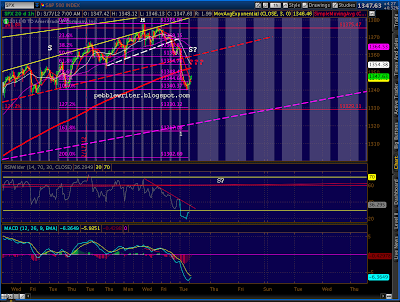 Will it have enough to close the gap at 1359.13? 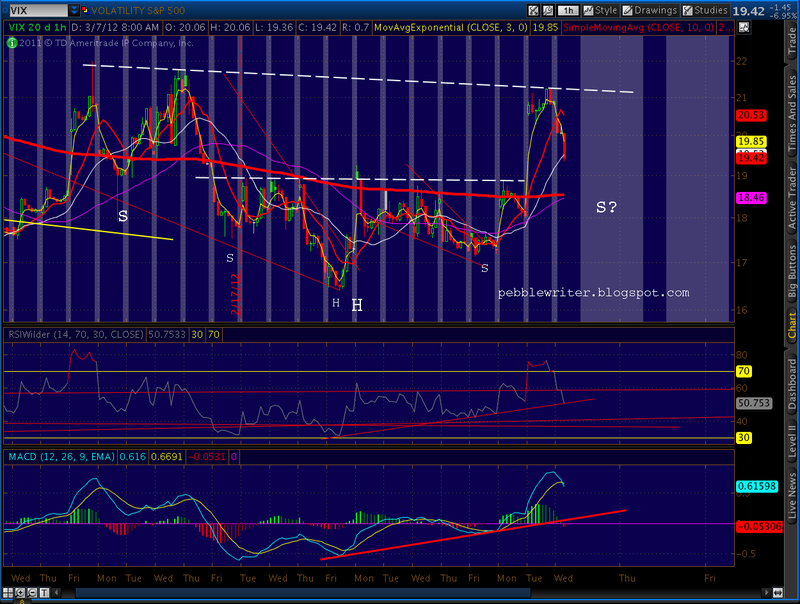 Perhaps, especially if we get take a breather to reset the RSI and reach it on negative divergence. 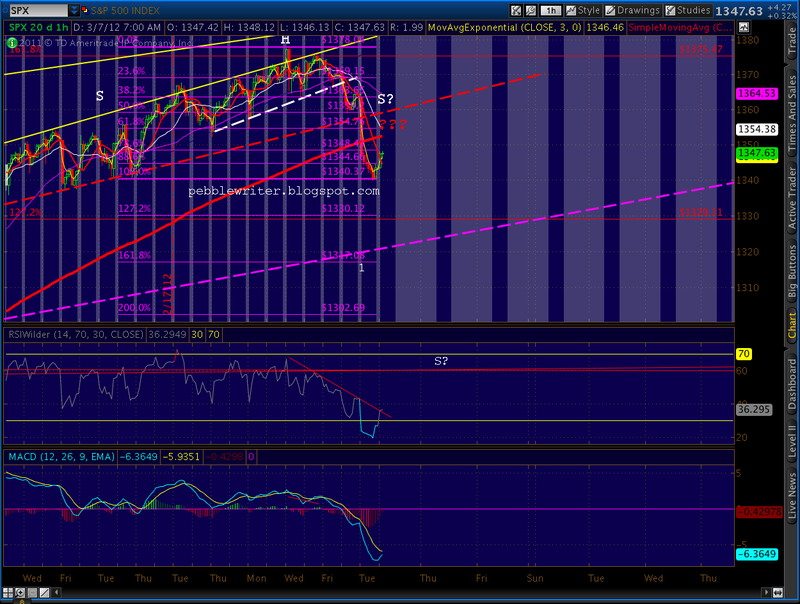 Yesterday’s target of 1354 still looks doable. VIX also seems to be thinking about closing its gap (19.25.) 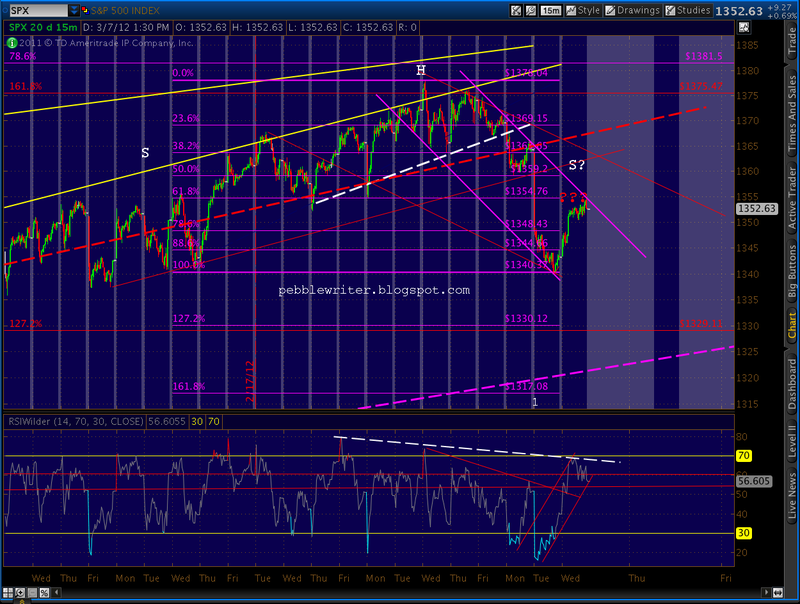 But, check out the RSI TL tag on the 60-min chart. Any further weakness in prices will be a stretch. Getting a little bounce this morning, nothing to write home about yet. 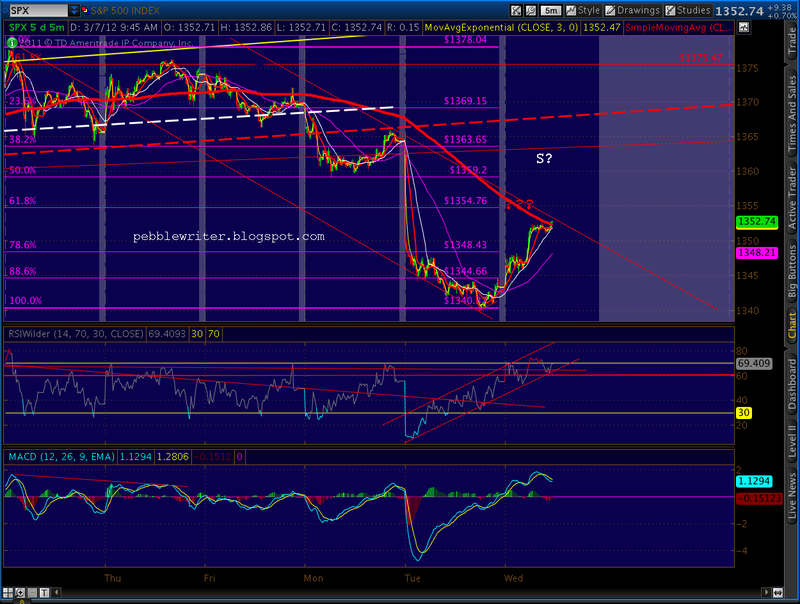 Though from the 30-min chart RSI and MACD, I wouldn’t be surprised to see us up over 1350. 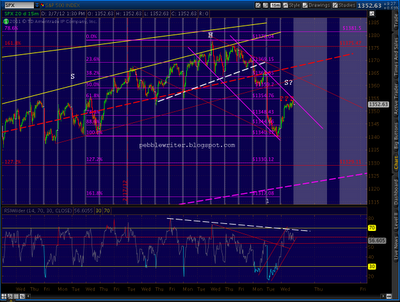 The key is the TL on RSI — if we break it we should easily reach 1354. 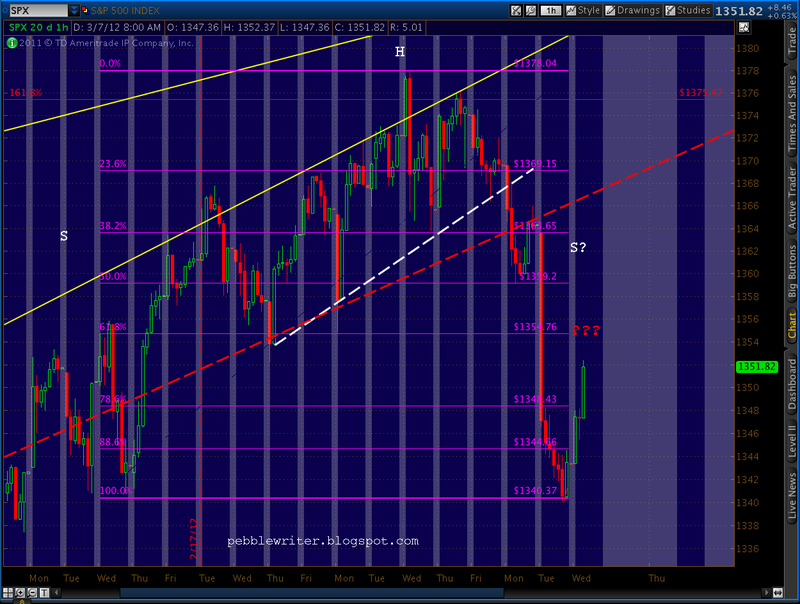 I’ll keep the SPY calls in place until I’m satisfied that the retracement has played out. I made two changes to the model portfolio this morning. First, I sold our TVIX position and bought a 4.5% UVXY position instead. It’s a leveraged ETF with 2X leverage, based on a blend of near month VIX futures. It has been reported that investors are dumping TVIX since Credit Suisse suspended creating more units — creating overhang that’s hampering prices. Yesterday, when TVIX was up 4.4%, UVXY was up 15.2%. I also increased our EUO position — the ultra-short Euro ETF — to 4.5%. This had mistakenly been listed on our spreadsheet as a short position. The ETF profits when the Euro drops, but is itself a long position. We now have a total long position of 250 shares. Yeah, there is a real problem with TVIX. 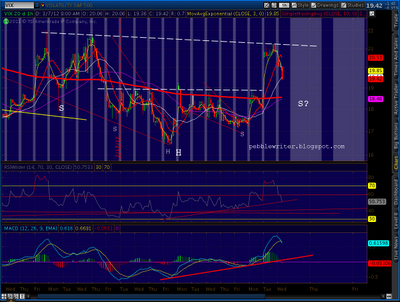 Maybe it'll catch up or something, but its not looking so great as a way to play the VIX. 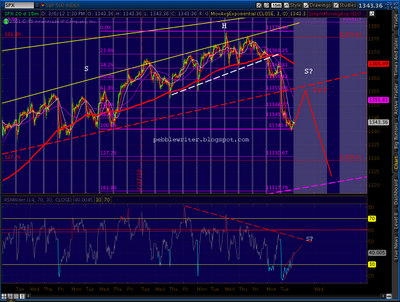 I agree this is just a minor retrace wave. I am pleased with how the last few days have worked out. I exited yesterday, and bought back the puts around 9 sp' pts higher…and 20% cheaper. All my targets for today broadly met, including the vix fall back to the mid 19s. *I re-shorted at 1353 earlier. So, now I sit back..and wait.